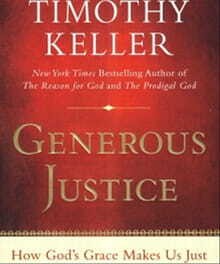 In his new book Generous Justice: How God’s Grace Makes Us Just, Rev. Tim Keller, pastor of Redeemer Presbyterian Church (PCA) in Manhattan, defines what justice really means. Keller describes our duty to all those who bear God’s image. He explains how the gospel affects our view of the poor. He discusses the relationship between word and deed ministry, the balance between evangelism and social justice, and the priorities of the local church versus those of individual Christians. ByFaithOnline spoke with Keller about the impact he hopes the book will have. What compelled you to write Generous Justice? I think there’s a fair amount of confusion—especially in our relatively small, Reformed, and evangelical circles—about the relationship of word and deed, both in the Christian life and in church ministry. The confusion actually goes back quite a ways. The Modernist Fundamentalists split about 100 years ago between mainline churches and conservative churches; that split, to some degree, has been over the role of social justice. The debate continues even today, as to whether we should be engaged with culture, and whether we should try to change society. So I thought I would speak to it. You define justice as “caring for the vulnerable.” That’s a different definition than most of us have. How does it square with our ideas about righting wrongs or punishing evil? If you want an umbrella definition of justice here it is: Giving people what they deserve. That means that every person comes into your presence with certain claims on you. For example, you’re not supposed to kill them; it says that in Genesis 9. Instead, you have the obligation to care for them and protect them—that’s your job. How do we do that? By giving them what they, as God’s image bearers, are owed. That’s what justice is—giving people what they’re due. So, we punish evildoers, and we care for the vulnerable. A few pages later you add to this definition. Justice, you say, is “right relationships.” What’s the correlation between our personal relationships and doing justice? When we define justice as giving people what they’re due, we’re actually saying, live with people in right relationship, we’re saying, relate to people as God would have you relate to them. That’s probably the ultimate, biblical definition, and it’s certainly the meaning of the [Hebrew] word tzadeqah, which appears scores of times in Scripture, and is translated ‘righteousness’ or ‘justice.’ It means to live in right relationship with those around you. It’s interesting, in Job 29 and Job 31, Job makes a list of the things that God requires of him in his relationships with others. At one point it occurs to him that if he keeps his food and his fleece--in other words if he doesn’t share with the poor--that violates God’s will. In God’s eyes, being generous with the poor is part of what it means to be rightly related to others. In Proverbs 3:27-28 we read, “do not withhold good from those who deserve it when it is in your power to act. Do not say to your neighbor ‘go and come again, tomorrow I will give it,’ when you have it now with you.” The Hebrew there essentially says, do not withhold good that belongs to your neighbor. It conveys the idea that your neighbor has a claim on you—just by being your neighbor. What’s more, it tells us that we have the power to do good, whether it’s by helping an elderly neighbor who can’t clean her own house, or by tutoring a neighborhood kid whose family can’t afford a decent school. Citing James 2:1-27 you write, “... that a life poured out in deeds of service to the poor is the inevitable sign of any real, true, justifying, gospel-faith.” There are people in PCA churches who give a credible Christian testimony, who don’t know a poor person. What do we make of that? Well, the key is the word inevitable, which means “in the end.” As people grasp the implications of the gospel, and as they experience the grace of the gospel in their own hearts, the less condescending they’ll be to the poor, and the more they’ll care for the practical needs of others, including the poor. We see the same reality with other aspects of the Christian life, like obedience. If you have a credible profession of faith you should want to obey God, right? And yet we see plenty of people, justified by faith, who aren’t as obedient as they should be. We see Christians whose lives don’t produce the fruit we’d expect to see. But we believe it’s inevitable. We believe that true justifying faith does, in fact, lead to good works. This is no different. Caring for the poor is, sometimes, one of the fruits we’ve yet to see, but it will inescapably come. You make the point that most people know they should help the poor. The problem, you say, is that they’re not properly motivated. How have they been improperly motivated? And how might they be better motivated? The improper motivation, obviously, is guilt. Now, I don’t think you can completely eliminate that, and there is the healthy kind of guilt Paul describes in 2 Corinthians 1, where he distinguishes between godly sorrow and ungodly sorrow. But there’s a kind of guilt—it stems from what I call the liberal approach to justice—which basically tells people: you’ve got a lot; therefore you owe the poor. The tone is coercive, and the intent is to inflict guilt. Jonathan Edwards [18th century pastor and theologian] made a different appeal. Edwards puts the conversation in the context of what he called the “Laws of the Gospel.” By that he means the natural motivations of the gospel: Christ’s substitutionary atonement and justification by grace. Edwards constantly reasons from the gospel. He’s saying if you’re a sinner saved by grace, then you know you’ve received God’s charity. You know you didn’t work yourself out of your situation. Therefore, you should look to the poor and be gracious, especially with your money. You should be gracious because you know how God has poured His spiritual riches on you. That’s how Edwards motivates people—not by guilt, but by pointing to the joy we’ve experienced—a joy that when properly understood causes humility; causes us to yearn to share what we’ve been given … So, I think we need two things to properly motivate people. One, we need people to think through the implications of grace. And two, we need to be around poor people. We need to see them and talk with them and rub shoulders with them. One of the things I’ve noticed about young people; when they go on short-term missions trips they almost always see poverty like they’ve never seen before. Usually, that exposure brings the knowledge that there are billions of people living in poverty. And it brings an understanding of God’s grace. You put those together, that’s the right motivation. You write: “To the degree that the gospel shapes your self-image, you will identify with those in need ….” What does the gospel do to our self-image? There’s an interesting place in James 1 where it says, “Let the lowly brother boast in his exaltation, and the rich in his humiliation ….” That tells me that I’m more wicked and lost than I ever dared believe. And, at the same time, I’m more loved and accepted, more beautiful in the sight of God than I ever dared hope. When you believe the gospel you have to admit you’re worse than you thought. But you’re more loved than you thought, too—because God’s love isn’t a matter of earning some reward in Heaven. It doesn’t depend on your performance. You’re more beautiful and more loved because the righteousness of Christ is imputed to you. In Chapter 1 James is saying this: If you’re poor it might be good to dwell on your righteousness in Christ. Here on earth, all you’re told is that you’re a failure. As a result, you might actually hate yourself, you might lose hope, you might not bother to find a job because you feel like "what’s the use?" But if you think about your high position, if you dwell on that aspect of your gospel identity—that will give you the hope to do your job and to face life. On the other hand, if you’re rich and successful, then, as a Christian, it behooves you to dwell on the fact that you’re just a sinner, no better than anyone else, and bound for Heaven only by the grace of God. So the gospel has got enormous social justice ramifications. It’s there, in Luke 1: “He has brought down rulers from their thrones, but has lifted up the humble.” It’s wonderful. Most of our readers work 40 or 50 hours a week. They have spouses who need their attention, they’re parents, they have homes to maintain …. When, where, and how does 'Micah 6:8' fit into a typical Christian’s life? Well, you could ask the same thing about evangelism, couldn’t you? In Scripture we see that Jesus Christ was mighty in word and deed. He preached the gospel with his words, and he embodied the gospel with his deeds. He fed the hungry and healed the sick and raised the dead. And His miracles, by the way, weren’t magic tricks. His miracles were helping people with their physical needs. And so we see that He had a miraculous deed ministry, and that He also had a word ministry. Every Christian is supposed to emulate Christ. Every Christian—as far as he or she is able—is supposed to be a prophet, priest, and king. And the fact is, we’re all busy. So let’s look at this from an evangelism perspective. With respect to evangelism the question we all face is this: How are we supposed to share our faith? Should we be involved with formal evangelistic efforts? Should we lead a small group in our home? Or a Christianity Explored group? Or should it just be informal? You think through the same issues with deed ministry: Should we be involved in something formal, like a soup kitchen? Should we tutor inner-city kids? Or should we just know about one other family and, in an informal way, try to help. They’re the very same questions. We’re all busy, but we’re supposed to do some word ministry, and we’re supposed to do some deed ministry with what little time we’ve got. There are some who view 'doing justice' and 'doing evangelism' as an either/or proposition. Is it? In the book I try to create a balance that I don’t often see. We have people who say the church needs to be involved in both evangelism and justice. But in reality—as most of the John Perkins Christian community development folks have realized—if you have a set of elders, and if it’s their job to build up the church, to preach the Word, to evangelize, disciple, and care for the flock—then it’s impossible to also run a bunch of complicated programs to reach the range of human needs. So, generally, people see the need to form their own non-profit. They leave church elders in charge of preaching the Word, while other members take on the work of doing justice. And so the idea that every local church should be equally involved in evangelism and justice—I don’t believe that’s true. As a minister at Redeemer my priority—the main thing I have to do—is to get people to believe in Jesus. If they believe, then I disciple them for word and deed ministry. But actually carrying out of the programs, actually managing the ministries that do justice in the city—that’s not the main thing a local church does. Evangelism takes the priority. That’s why you see in Acts 6, for example, that even the mercy ministry within the church is delegated to the diaconate. In Acts 6 the elders explain that they’ve got to concentrate on the ministry of the Word. So, because mercy’s important, they delegate. So, inside the church, word has priority. But an important purpose of that word ministry is to disciple our people to work outside the church, to work in the city, to evangelize and do justice—to make both an integral part of their lives as they engage those around them. That’s the set of balances we don’t often see. So often the justice component won’t grant that the local church ought to give priority to the Word. On the other hand, a lot of folks fear the “social gospel”—that’s how they phrase it—they give Christians the impression that justice isn’t something we need to be involved with; that we’re here strictly to evangelize. And so what I try to say is this: ‘No, grace makes you just, and justice is crucial. Every Christian should be doing word and deed ministry. But, that the local church ought to put the priority on building up the flock and the ministry of the Word. You discuss an idea from 1 Chronicles 1 that the righteous are willing to disadvantage themselves for the sake of the community, and that the wicked are willing to disadvantage the community for the sake of themselves. How are we to disadvantage ourselves for the sake of others? I’ll be real practical about this. We recently bought a property and now we’re renovating and building. As you might expect, we have neighbors who are expressing consternation. I’m sure that in any setting, not just the urban setting we’re in, church neighbors worry about traffic on Sunday and all kinds of other issues. But, if the Presbyterian church, even though it had the legal right to do what it’s doing, disadvantaged itself because neighbors complained—those neighbors would see that. If we gave our neighbors certain assurances about our schedule—about the things we would and wouldn’t do at certain hours and on certain days—they would see that we’re disadvantaging ourselves. That’s a low-level practical thing, but I’ll tell you this: if your neighbors don’t feel like they can talk to you; if they’re sure you’re going to cling to your legal rights no matter how unhappy it makes them, you’re not showing much civic spirit. It’s interesting to me, and instructive, that the Jews here are so civic-minded. They’re at every community board meeting, they vote, they’re involved in the neighborhood associations. And it’s clear that it comes from their culture and their theology. Too often, evangelical Christians and Presbyterians are not perceived that way. Instead, we’re perceived as being tribal. Timothy Keller was born and raised in Pennsylvania and educated at Bucknell University, Gordon-Conwell Theological Seminary, and Westminster Theological Seminary. He served as a pastor in Virginia for nine years, and in 1989 he started Redeemer Presbyterian Church in Manhattan with his wife and their three sons. Keller is the New York Times bestselling author of The Reason for God. He has also authored Ministries of Mercy, The Prodigal God, and Counterfeit Gods. Richard Doster is the editor of byFaith. He's also the author of two novels, Safe at Home and Crossing the Lines, both published by David C. Cook publishers. This article originally appeared at byFaithOnline. Used with permission.